Here is a video I just created to show you some tips and strategies on using Sweeva! If you aren’t in Sweeva yet you can join here. If you have any questions or comments make sure to reply to this blog post! Thanks Austin, it's a great site – well done! I loved the video, good tips. I'm new only here two days and learning a lot. Glad you liked it William! You have out done yourself with this new site… I really like the interaction this site offers. Actually you have made advertising a fun experience!… Great job! Just saves the hassle of another bid, though it doesn't give you the suggested bid. Yes I realized that afterwards too, thanks for mentioning it, it will be helpful to others. Great job Darren! In your video you went to browsing so that you'd be there when your page shows. You can also be in the back office (Home) and the sites being displayed currently shows up on a small tool bar at the bottom which is a live update and as soon as your site shows there you can click on it and it will take you to the browsing page. Yes, you're right. Thanks Bill! 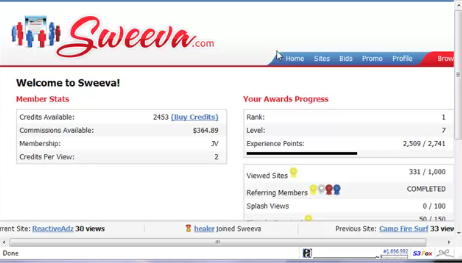 Because of you i now understand how this works, specially the bidding process – you made a very good job explaining it very well – which on the other hand, the sweeva page does not. Very neat. I am signing up right now! I seem to understand how this works. I bet it works way more better than traffic exchanges. I am about to cancel of their accounts now just for this! Next Post: 6.5% optin rate on a Traffic Exchange?